Browse: Home / Updates Veil-Evasion v-2.20 : is a tool designed to generate metasploit payloads that bypass common anti-virus solutions. Updates Veil-Evasion v-2.20 : is a tool designed to generate metasploit payloads that bypass common anti-virus solutions. + This release includes Go language payloads. This is the latest stable version of Veil-Evasion. Veil-Evasion is a tool designed to generate metasploit payloads that bypass common anti-virus solutions. Run ./setup.sh on Kali x86 (for Pyinstaller). Install Python 2.7, Py2Exe, PyCrypto, and PyWin32 on a Windows computer (for Py2Exe). Veil-Evasion was designed to run on Kali Linux, but should function on any system capable of executing python scripts. 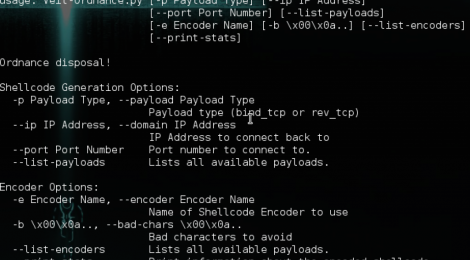 Simply call Veil-Evasion from the command line, and follow the menu to generate a payload. Upon creating the payload, Veil-Evasion will ask if you would like the payload file to be converted into an executable by Pyinstaller or Py2Exe. If using Pyinstaller, Veil-Evasion will convert your payload into an executable within Kali. Move all three files onto your Windows machine with Python installed. All three files should be placed in the root of the directory Python was installed to (likely C:\Python27). Run the batch script to convert the Python script into an executable format. Place the executable file on your target machine through any means necessary and don’t get caught! ← Arpy is an easy-to-use ARP spoofing MiTM tool.